EUREKA – They’re here! 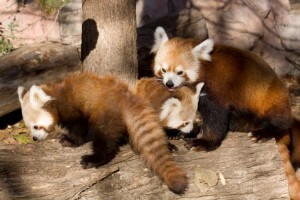 Sequoia Park Zoo’s two Red panda brothers, Shifu and Sumo, will make their public debut on Friday July 9. Construction for their new home in the redwoods began last winter and is now complete, thanks to generous support from local businesses and the community at large through fundraising efforts by the nonprofit Sequoia Park Zoo Foundation. Shifu and Sumo have settled into their new home quickly, and seem to be quite happy with Eureka’s weather, which is not dissimilar from their wild homelands. Red pandas are found in the mountain forests of Nepal, India, Bhutan, China, and Myanmar (Burma) in Western Asia and are an endangered species. Sadly, they are nearly extinct in the western part of their range because their forest home is being sacrificed to development. Their beautiful red fur is also coveted for clothing decoration in some cultures. Today, there are thought to be fewer than 2,500 Red pandas remaining in the wild. Red pandas are related to Giant pandas and bears, but may be most closely related to raccoons, which they physically resemble. They are unique enough to be grouped in their own distinct family, and scientists are still studying them to determine their genetic ancestry. Red pandas are most active in the early morning, late afternoon and at night, foraging on the ground or lounging in the trees. In the wild, they are mostly solitary creatures, but come together in pairs in the winter breeding season. Red pandas eat mainly bamboo leaves and shoots, grass and fruit, but will also occasionally eat eggs, insects, and small animals. Bamboo in particular is hard to digest, so they spend much of the day resting in trees to conserve energy. With the arrival of these enchanting creatures, Sequoia Park Zoo joins 80 other zoos around the world that are helping to preserve Red pandas for future generations. The species is managed cooperatively by the Species Survival Plan, a conservation program of the Association of Zoos & Aquariums and part of the Zoo’s commitment to Red pandas includes funds for conservation programs in their native range. Sequoia Park Zoo’s Red panda exhibit marks the completion of the first phase of Asian Forests, one of six themed zones as laid out in the Zoo’s 2006 Master Plan. This zone will eventually include the gibbons as well as other natives of the Asian Forest biosphere. The mission of the Sequoia Park Zoo Foundation is to promote and stimulate interest in the Sequoia Park Zoo and support the zoo’s development, operation and education programs through fundraising, marketing, and other initiatives designed to enhance the zoo experience. This entry was posted on Tuesday, July 6th, 2010 at 11:31 am	and is filed under Community, Animals. You can follow any responses to this entry through the RSS 2.0 feed.